Akela: Do you want to be a Cub? You: Yes, Akela, I do. Akela: Do you know the Law and Promise of the Wolf Cub Pack, the Grand Howl, Salute and Handshake? Akela: What is the Law? Akela: Are you ready to make the solemn Promise of the Wolf Cubs? You: Yes, Akela, I am. Then you make the Cub Salute and repeat the Promise after Akela. 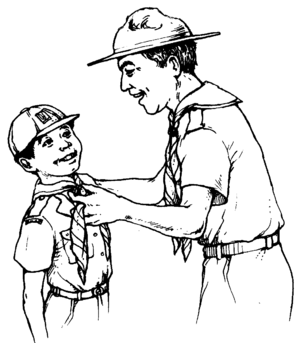 Akela shakes hands with you and welcomes you to the world-wide Scout movement. You are given your badges and scarf, then you turn around to salute the Pack. All the Cubs will salute you in return and you will join them in the Grand Howl for the first time. This page was last modified on 15 October 2018, at 20:21.